I agree that it's hard to tell when the ball is going to hit the paddle, that's why I added the 2D views and made the paddle flash on impact (+ sound effect). I experimented a bit with the camera placement, but putting the camera further up, at an angle, would make it too difficult to tell where the paddle is in relation to the ball. Placing it in the middle, at the end of the playing field (behind the paddle, but not moving along with it), also made it too hard to judge the ball's position. 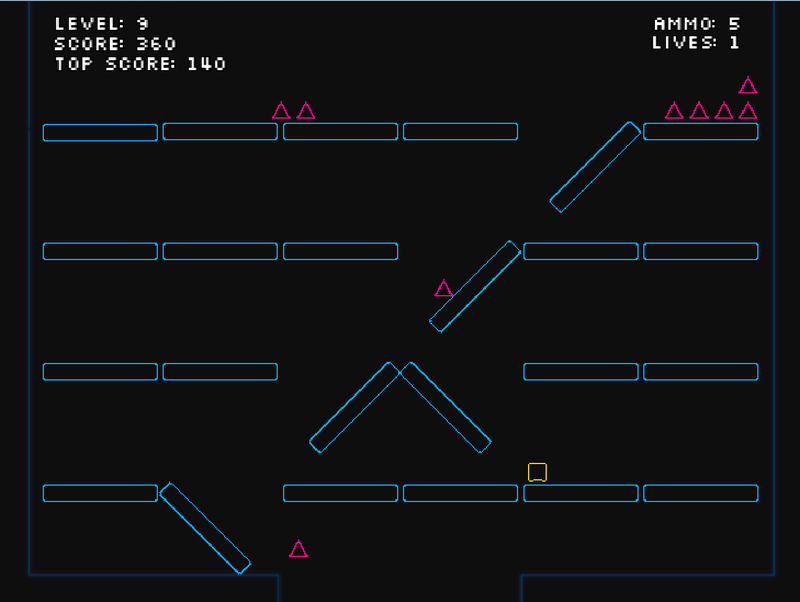 I also thought about adding lines to the walls that show where the ball is along the Z axis, like in this video. But since I wasn't using wireframe graphics, I couldn't think of a way to add them without looking distracting or out of place. Do you have any suggestions how the camera could be placed instead? - At one point, the triangles all went into the right corner at the top and stopped moving. - Whenever I attempt to shoot after picking up an ammo pack, the game freezes for a few seconds, then it crashes. It doesn't matter whether I shoot at an enemy or anywhere else. I tried the 64 and 32 bit Windows builds on Windows 7. The crash bug happens in both versions. Cool game with great graphics and music! Did I overlook something or is there no way to exit, besides Alt+F4? Escape didn't work and I didn't see an option to quit. I liked the beach part best. Yes, you can use any engine.